An online safeguarding training course specifically for Childminders and their assistants, covering essential topics such as legislation, online safety, anti-radicalisation, indicators of abuse and neglect, and how to report concerns. I felt this worked for me as when I have been to courses in the past, I felt I missed things. Whereas with this I could take my time and take in all the information in my own time. I am a lone worker. Is this child protection course suitable for me? Yes, the child protection course contains detailed modules on recognising signs of abuse and neglect and reporting concerns. It addresses the unique issues that arise from being a lone worker. If I employ an assistant, can they take this child protection training? 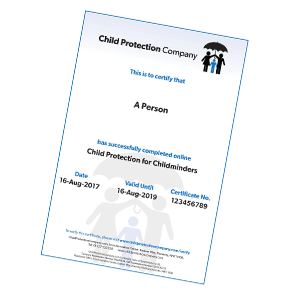 Our Child Protection for Childminders course has been written specifically to meet the needs of Childminders and their assistants. Each of you will need to take the child protection training individually. When you’re registering, make sure you set up your account as an organisation. That way, you can add other members of staff to your account. If you have already registered and want to convert your account to an organisation, just give us a call and we can do that for you. Our Child Protection for Childminders course has separate modules on anti-radicalisation and the Prevent duty, as well as e-Safety training, which fulfils the safeguarding outcomes as specified by Ofsted. It is essentially three safeguarding courses in one, saving you both time and money. Is this Level 2 safeguarding training? The safeguarding training levels no longer apply to Childminders, however this comprehensive course equates to the old Level 2 standards. This course is designed to meet the child protection training requirements for Childminders, which is laid out in the statutory guidance for the safeguarding and promotion of welfare for children. Every day in the United Kingdom, over a quarter of a million children are placed in the care of Childminders. It is no wonder that the agencies who protect our children see you as vital in the process of safeguarding. Sadly, child abuse and child sexual exploitation are an all too common occurrence. By the end of the module, you will have an increased awareness of the importance of the role Childminders can play in the safeguarding of vulnerable children by spotting the early signs of abuse and neglect. By the end of the module, you will have an increased awareness of the definitions of key terms such as ‘child’ and ‘safeguarding’. You will also be more familiar with the legislation and guidance that applies to your role as a Childminder. Due to the frequency of contact with a child, you are in a unique position to identify and raise concerns about potential issues regarding their welfare. This module will give you an overview of the expectations of your safeguarding policy and some guidance on how you can become a point of contact for safeguarding in your local community. At the end of the module, you will have a better understanding of how you can meet the expectations of inspecting bodies and what safeguarding procedures you should have in place. All Childminders have a legal duty to prevent pupils from being drawn into extremism. Childminders are expected to challenge extremist ideas and recognise when children are at risk, and Ofsted will expect to see Childminders and their assistants taking steps to protect children from radicalisation and extremist views. This module places the Prevent strategy into context and considers the ways in which radicalisation can affect a young person, and the groups that may attempt to induct a young person into their ideology. By the end of this module, you will have a better understanding of what it means to be child-centred in your approach and the responsibilities of Childminders in relation to documenting decisions. This module will look at the process in place should a child potentially be considered ‘in need’ in some way. All agencies work together to protect children, using guidelines to define common practice. By the end of this module, you will have a better understanding of the Assessment Framework and your role within local policy and the law. Your experience and your training should now mean that you will be clear and confident in your role within the safeguarding process, and this will form the basis of your ability to interact with other agencies. In this module, you will look at the agencies who work towards child protection and some of the tools that they use to help safeguard our children. Collectively, the agencies in your area will work with the Local Safeguarding Children Board (LSCB)/Safeguarding Partners or Child Protection Committees to ensure policy is followed. By the end of this module, you will be have a better understanding of how to work with agencies to safeguard children. You will also have an overview of how to reduce the risk of complaints against staff, and how to deal with any that may be raised.